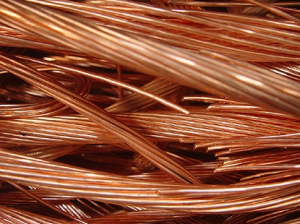 Copper Recycling – Action Recycling Center pays top prices for all types of copper. Copper is commonly used in the electrical and plumbing trades. Copper is the third leading metal produced after iron and aluminum. Copper usage is rapidly expanding as more and more products are containing computer and electronic components. An example of this is automobiles – 30 years ago a car would contain around 30 to 35 lbs. of copper but this now has increased to well over 50 lbs. on average and some cars may contain as much as 80 lbs. A modern Boeing 727 contains about 9,000 lbs. of copper. Copper is one of the first known metals to be used by man. Many ancient artifacts have been found made of bronze (copper and iron). Bare bright wire is expected to be very clean and pure. This usually will include any 12 gauge solid strand sized wire or larger that has been stripped from it’s shield and is free from tarnish or any other impurities that keeps it from being “bright and shiny” in appearance. Most often MCM stripped wire is the item commonly bought as bare bright but could include other wire that has been stripped also, as defined above. This is copper pipe that contains any solder, paint or visible corrosion. Because this contains solder (lead and tin), this copper is often bought from foundries that make brass since it already has some of the the base elements. Some refineries also refine this into pure copper. size is ranged from 100 MCM to 1000 MCM, 100 being the smallest.